All the guide books tell you that, in Argentina, you're going to enjoy a lot of beef. But what a lot of people don't tell you about is the pasta. Argentina has a mixed population - Bolivians, Spanish, Columbians and native Argentinians, to name a few. But it also has a large number of people with Italian descent. And it's most prominent when you look at the food. 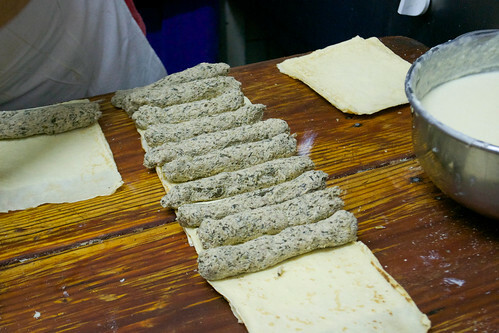 We stopped by a little shop in Haedo, just outside Buenos Aires, that sells nothing but fresh pasta. 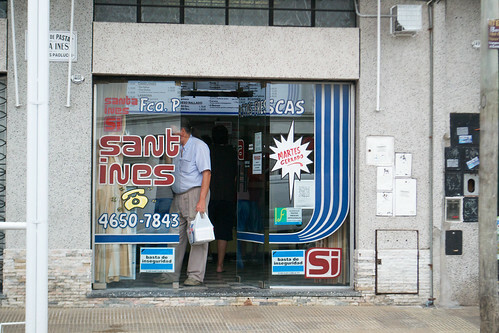 As you walk into Santa Ines, you can smell the fresh, eggy pasta straight away and see the nests of freshly made spaghetti and boxes of ravioli, all with different fillings. 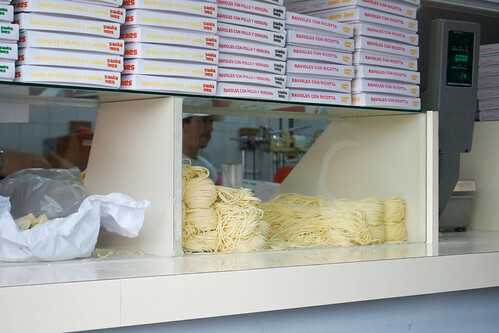 The pasta is sold by weight, and there are various raviolis to choose from, including chicken and ham (pollo y jamón) and straight ricotta. We bought a couple of boxes of the ricotta-filled ravioli to eat for lunch with a beefy bolognese sauce and Parmesan sprinkled on top. When we mentioned that I wrote about food, the manager beckoned us through to the back of the shop, so we could see all that was going on behind the scenes. 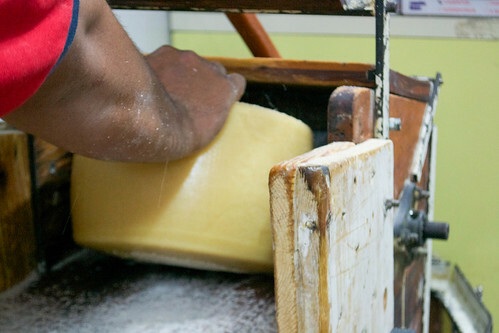 It was refreshing to see the pasta being prepared by hand, with simple, basic ingredients. There's nothing processed here - it makes me wonder why shops such as these don't exist here at home. 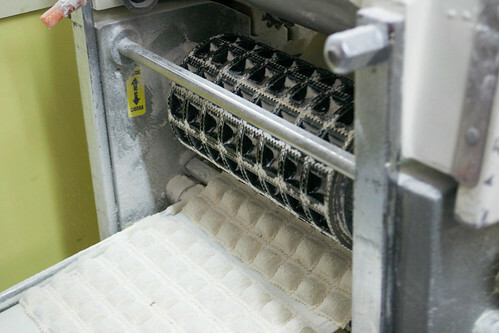 We saw a huge wheel of Parmesan being grated, ready to add to cannelloni and lasagnes and also sold in bags on the side for people to take home and dredge all over their chosen pasta. A fantastic group of ladies filled and rolled cannelloni and made them up in foil trays, ready for people to take home and bake. 'Which channel are we going to be on, then?' they joked as they fluffed up their hair, as I snapped the food with my camera. To the side, a ravioli machine pressed the filled pasta, so it was ready to cut into portions and box for sale at the front of the shop. The atmosphere was fun, the workers joking with us as we shuffled around: they spoke Spanish, I replied in Spanglish. I thought this was a one-off, but there are lots of shops selling 'pastas frescas' around Buneos Aires, and in Argentina as a whole. Pasta (and pizza for that matter) are a huge part of Argentinian cuisine, and many people outside of the country don't realise it. When we ate our ricotta-filled ravioli, it was delicious: pale and extremely light, with a generous filling. Pasta like this takes a long time to perfect, and can take hours in the kitchen to make at home. It's a far cry from those gluey, tough little tortellinis and raviolis we're happy buying in the chiller cabinet of the supermarket. I just wish we had a shop like this at the end of every street in the UK. I miss my pasta place! The one I go to in my neighbourhood is La Duquesa (Av Forest 1163, Buenos Aires), their "ravioles caseritos" are amazing! And their chicken lasagna is to.die.for! 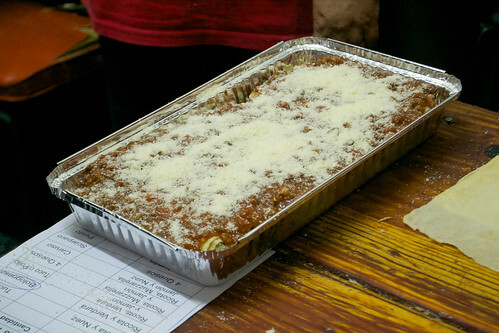 Also, when I go to my cousin's we buy pasta at "La Modelo de Vicente Lopez" (Las Heras 1403). His butternut squash ravioles are amazing! We usually also buy his homemade filetto tomato sauce, delicious! I really wish you could get fresh pasta from a proper place and not from packed at supermarkets, the difference in the pasta itself is huge! Supermarket stuff tends to taste a bit thick or plasticky. I really miss them Jorgelina! The chicken and butternut squash pasta you mention sound amazing - I was really surprised to find one of these pasta shops at the end of practically every street. And our family just treat them as we would 'fast food' places - just pick up some fresh pasta and it's ready to cook at home. And I also agree that supermarket 'fresh' pasta just seems to be too tough and chewy - nothing like home made stuff. Thanks for commenting!